from Woodstock and Woodstock North high schools. 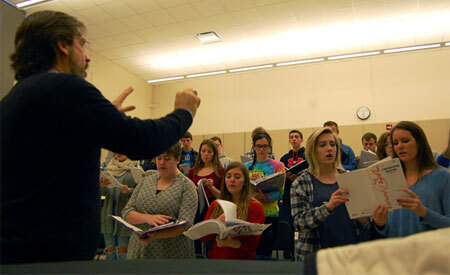 Cor Cantiamo, a professional ensemble in residence in the NIU School of Music, will travel to Woodstock to collaborate Sunday, Feb. 21, with the choral students from Woodstock and Woodstock North high schools as a part of Cor Cantiamo’s Masterworks Project. “Working with Dr. Johnson and Cor Cantiamo is a new experience for the students at Woodstock North,” Woodstock North Chorus Director Megan Kim said. The Masterworks Project is an educational outreach program created to bring aspiring high school vocalists and professional singers together in concert. During the Masterworks Project, the high school chamber choirs will have the opportunity to rehearse and perform side by side with members of Cor Cantiamo. The project will result in a combined performance by all three choirs performing Leonard Bernstein’s “Chichester Psalms.” Each ensemble will perform a solo set in the first half of the concert, followed by the festival chorus coming together to sing Bernstein. “Chichester Psalms” also features a boy soprano soloist. Through an audition process, Gabriel Filetti, 11, a fifth-grade student at Olson Elementary School in Woodstock, was selected to perform it. The concert will be presented at 3 p.m. Sunday, Feb. 21, at Grace Lutheran Church, 1300 Kishwaukee Valley Road in Woodstock. Tickets for the performance can be purchased at the door; tickets are $5 for adults and $3 for students. Children 5 and younger are free. 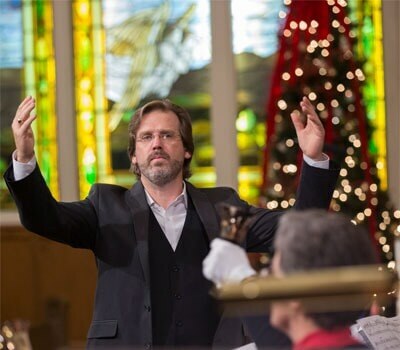 Cor Cantiamo is a touring chamber choir founded with the mission to perform and promote contemporary choral music and foster new composers for the art form. For more information, email info@corcantiamo.org.